It's probably safe to say that one of the most anticipated events at Celebration Orlando was The Last Jedi panel. At Star Wars Celebration Anaheim in 2015, the trailer for The Force Awakens was the panel that kicked off the entire weekend with a bang. The following year, a panel for Rogue One: A Star Wars Story took place in London for Celebration Europe II. Both Celebration panels released a trailer for their respective films. Needless to say, fans from all over the world gathered this past weekend with the expectation that a trailer for The Last Jedi would debut. With the increasing popularity of the Star Wars franchise over the last few years, it's become known that if you want to see the panel live, you must put in the time and effort. Dedicated fans from all over began to form a line on the morning of Thursday, April 13th. It wasn't until around 8 P.M. that same day that the lines were transferred from outside the Orange County Convention Center to an inside queue. Fans would wait in this queue for a wristband that would guarantee them a seat in the live panel on the Galaxy Stage. Wristbands wouldn't be handed out until 6 A.M. on Friday. April 14th. Sleeping on concrete isn't necessarily the most comfortable way to spend your night, but for many fans the reward is priceless. Eager fans spend the night in line for The Last Jedi Panel. Kathleen Kennedy (President and CEO of Lucasfilm) and J.J. Abrams (Director of The Force Awakens) have done a marvelous job taking care of the fans during previous overnight waits by delivering pizza and donuts to the fans. Rian Johnson (Director of The Last Jedi) made a 4-hour appearance to the fans waiting overnight for his panel. At first the director was swarmed by fans who wanted an autograph and a selfie. People in the queue were frantically shuffling through their things to find the perfect item for Johnson to sign. The director's security team stated that he'd be visiting every row in the massive queue. It seemed pretty hard to believe that that would actually happen considering the fact that he was being swarmed by fans and not making much progress. 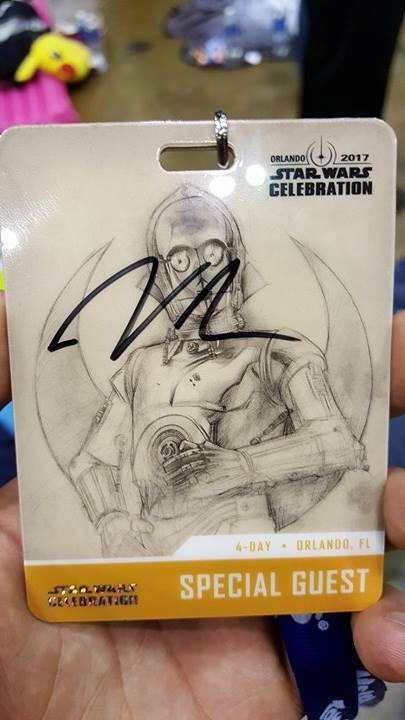 After slowly making his way through the first row, Johnson set up shop outside of the queue line and made his way through a separate line of fans who semi-patiently waited their turn to meet the man who was going to bring them the next Star Wars installment. At 6 A.M. wristbands were handed out. The wristbands were red and were specific to this particular panel. The panel itself didn't start until 11 A.M. Well, you might be thinking: "What are you supposed to do between 6 A.M. (when wristbands were given out) and 11 A.M." (the time when panel starts)? The wristband guaranteed you a spot in the panel room, so you could theoretically go back to your hotel room or car and sleep for a few hours. Having said that, most people went directly into another queue after receiving their wristband to ensure they got a good seat for the panel. Wristbands for The Last Jedi Panel handed out at 6 A.M. Shortly after 10 A.M., fans in the queue were corralled into the Galaxy Stage auditorium. DJ Elliot and his co-host Mark Daniels entertained fans by launching t-shirts into the crowd, playing music, and hyping up the "zombies" that existed in the audience. Before you knew it, the host of the panel, Josh Gad, walked out to kick off the morning's activities. 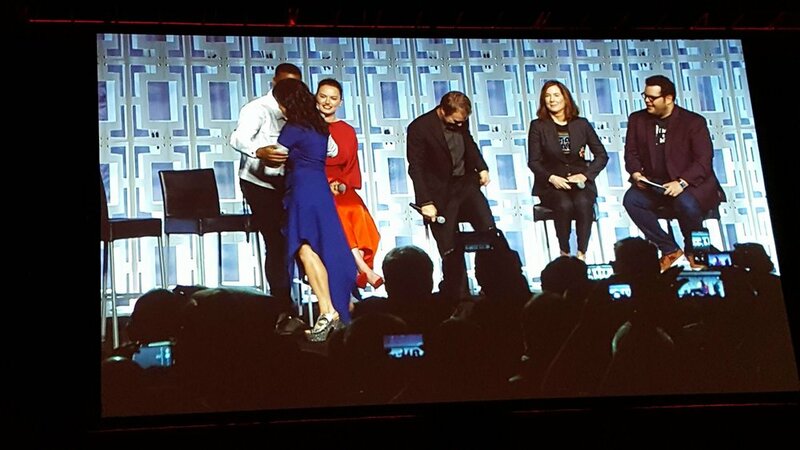 Kathleen Kennedy and Rian Johnson were the first guests invited on stage. Rian Johnson mentioned the film has entered the post-production stage, which is very exciting. Fans cheered uncontrollably as content and more information was dropped into their laps. The energy in the Galaxy Stage auditorium filled the entire convention center and traveled through the livestream screens to the fans watching all over the world. 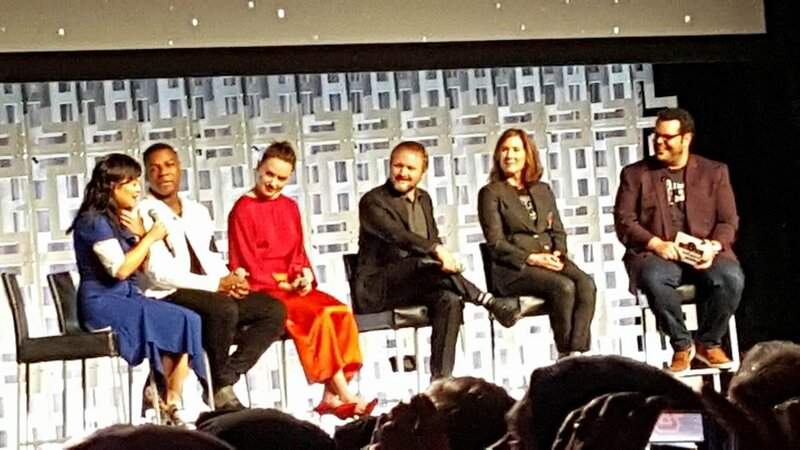 Kathleen Kennedy and Rian Johnson talked a lot about the importance of Carrie Fisher and strong female characters in the story. That was Josh Gad's cue to introduce one of the most popular new members to the Star Wars family, Daisy Ridley. The welcome that Daisy received after walking out on stage was filled with energy and tears of joy for many fans. Daisy discussed that she's most excited to see Luke's first words and she also divulges that some times when people meet their heroes, it's not always what they expect. What does that mean for when Rey meets Luke? Many people within the Star Wars fandom found themselves discussing how BB-8 actually worked. Did he move on his own? Was it CGI? Those answers were quickly revealed in The Force Awakens Panel at Celebration Anaheim when BB-8 came rolling out alone on stage. 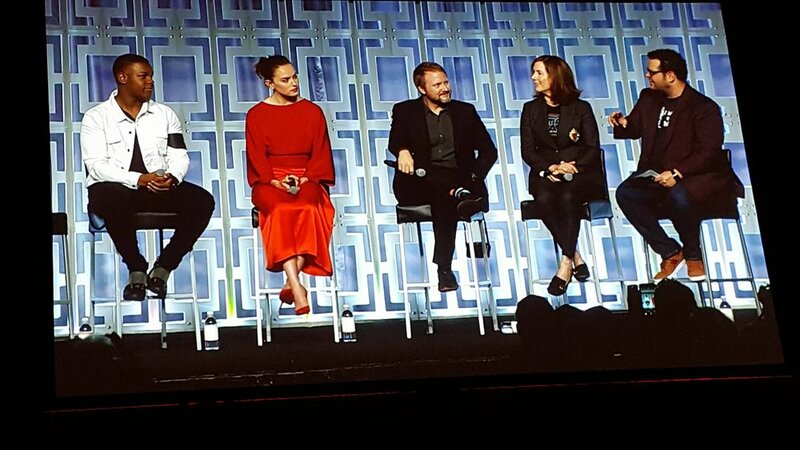 The spherical droid made another appearance on stage at Celebration Orlando during this panel. Josh Gad and BB-8 had a comical interaction for a few minutes before BB-8 rolled backstage. 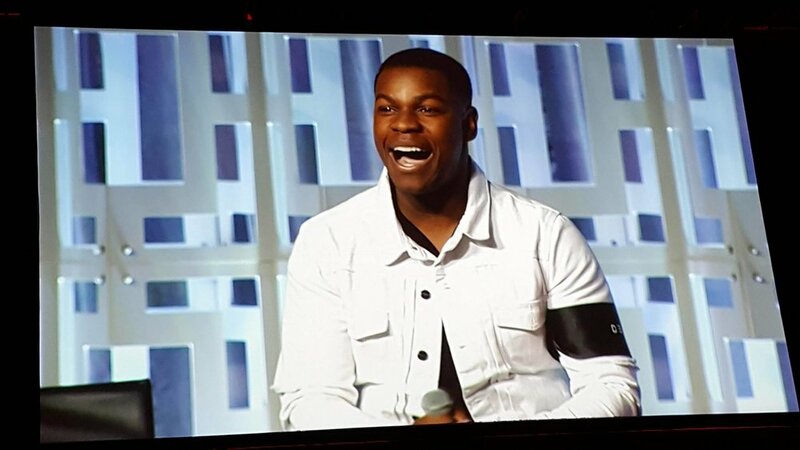 John Boyega induced an eruption of cheers as he made his way on stage. He referred to being at a Celebration with Star Wars fans as "coming home" and even spent some time on the show floor after the panel concluded. Boyega mentions that the relationship between Finn and Poe will be expanded on in The Last Jedi and it's been a process for Finn to recover since the last time we'd seen him in The Force Awakens. Star Wars films are known for introducing beloved characters that fans adore. Rian Johnson reveals the newest "big role" character who is played by Kelly Marie Tran. Tran plays a member of the Resistance named Rose. 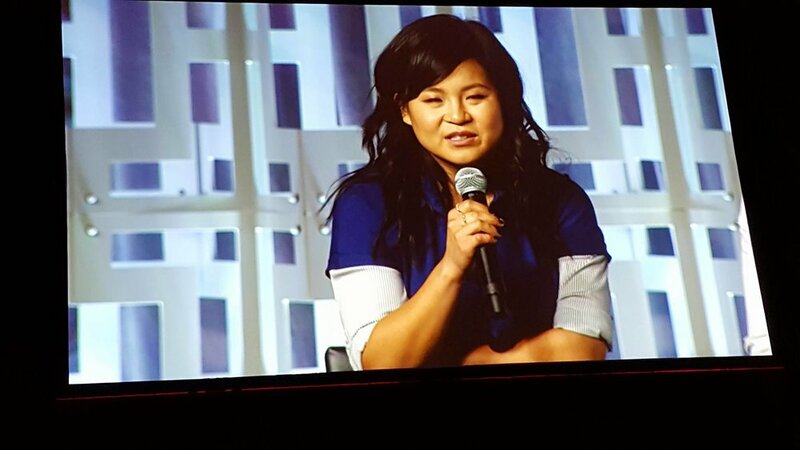 Kelly Maria Tran made her way out on stage and discussed what it was like having to keep secrets about being cast in the film and joining the Star Wars family. The Force Awakens ended without one word spoken by Luke Skywalker, the main character of the original trilogy. 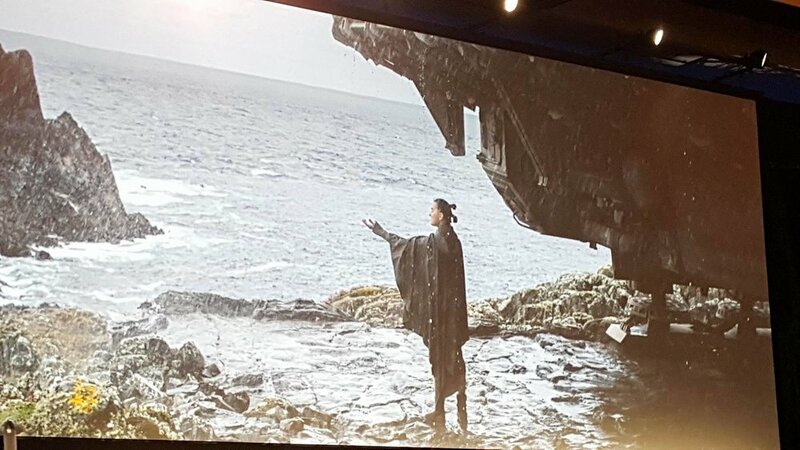 At the conclusion of that film, Rey finds Luke and the screen cuts to black. With Luke expected to have a more prominent role in The Last Jedi, it wouldn't make sense to leave Mark Hamill out of The Last Jedi Panel. Mark is always so appreciative of the fans and everything that Star Wars has brought to him. Hamill was very humble and excited for what's to come. Toward the end of the panel, fans were getting anxious about the trailer. The panel had been going on for over an hour and no trailer had been shown. Rian Johnson made an announcement revealing that he had a surprise for the fans. People inched towards the edge of their seats, their hearts beating at a rapid pace with excitement and with anticipation for what they were about to see. Rian Johnson revealed a teaser poster. You could hear the gasps in the room from people who were expecting a trailer and weren't getting it. Rian Johnson proceeded to assure the fans that they wouldn't be disappointed. The reveal for teaser poster for The Last Jedi began with a closeup of Rey holding a blue lightsaber, and then the camera panned out to expand over the entire poster. The poster features Rey holding a saber directly towards the sky with the beam of the saber dividing the faces of Luke Skywalker and Kylo Ren. Every fan in the audience would receive a copy of the poster following the panel. Shortly following the reveal of the teaser poster, it was time to give the fans what they wanted....the teaser trailer for one of the most anticipated films of 2017. Similar to Celebration Anaheim in 2015, the trailer was shown twice back to back.